It's possible to make an evasive, reticent hero interesting to watch, but probably better to make him say something. On paper, Mr. Robot and Preacher could not be more different, and yet the twitchy, edgy thriller about a twitchy, edgy hacker is way better than it had any right to be, and the sumptuous, bloody comic book adaptation is somehow a bigger letdown than anyone thought was possible. How did this happen? Preacher is based on a truly wild, fast-paced comic of the same name, and in bringing it to television, co-creators Seth Rogan and Evan Goldberg made the decision to render Season 1 as a more palatable origin story which focuses on introducing the characters to the viewer. It seemed like a solid plan, and the first episode managed to have the same manic pace and bombastic violence of the source material. Jesse got his power and… that was it, that was the origin. Now, the series has trickled off into long moody scenes of fascinating characters refusing to talk to each other. The obvious answer to the problem here would be, have your characters interact more. Yet, Mr. Robot made an exhilarating and innovative first season out of a whole lot of Rami Malek’s bug-eyed silence. What’s the key there, the one Preacher missed out on? For one, the audience is still able to hear Elliot’s thoughts via the Fight Club-esque voiceover. We don’t necessarily want to give Jesse Custer a voiceover — it’s a risky choice that easily becomes tedious — but it works in Mr. Robot to give the viewer an initial look into Elliot’s tension with himself, setting up the more dramatic inner conflict that comes later. The viewer feels deeply for Elliot when his relationships suffer from being unable to verbalize his thoughts. Season 1 of Preacher explains how Jesse comes to have the relationship that he does with Genesis, in real-time as opposed to using flashbacks, as the comic source text did. But instead of clearly showing his inner conflict, we are treated to long, beautiful but empty shots of Jesse drinking in a church pew and staring sullenly at the middlespace. The most interesting insight we’ve gotten into the character actually came in the most recent episode, when it pulled a bit of a Mr. Robot and had Jesse converse with an imaginary Eugene. Finally, Jesse is able to verbalize his feelings about Genesis, after 7 long episodes of being evasive and defensive. It’s a relief to see him finally externalize some vulnerability, but the payoff isn’t enough for all the time it took coming. Jesse Custer may be a hard-drinking, soic action hero in the comics, but he needed to be more expressive in the show if he was going to carry a whole season of tormented-character building. Malek carried the first few episodes of Mr. Robot from an iffy premise to must-see with his supreme watchability. The voiceover escaped tediousness because Malek’s minute facial tics and character business were so compelling; the show felt urgent and in motion even in Elliot’s long silent stares, because he seethes with nervous energy in every onscreen moment. So, it’s not impossible to make a evasive, reticent main character interesting to watch, but he better be exceptional. Dominic Cooper, for all his brooding handsomeness, and his whiskey bottle don’t pull it off. 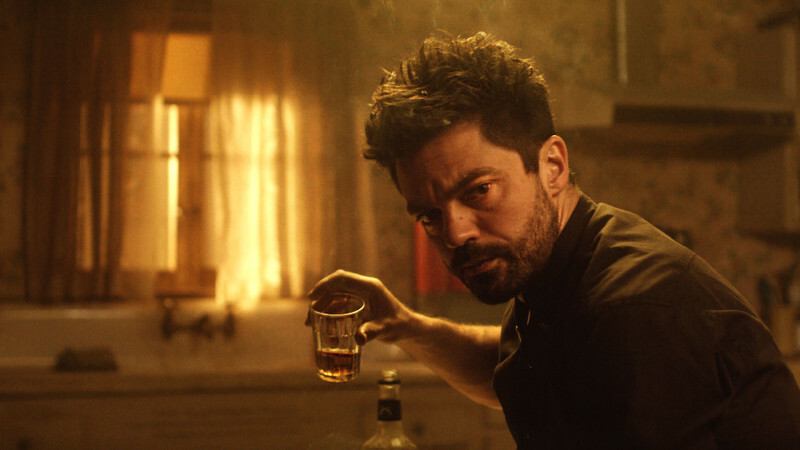 Preacher has also hobbled its two most interesting, explosive characters, Cassidy and Tulip, by choosing to focus too much on Jesse’s moody indecision. The show rarely manages to even put them all in the same room. In Episode 1, they seemed like the two most exciting new characters on TV, with bombastic entrances and goddamn perfect casting. Ruth Negga’s considerable charm and magnetism are wasted with repeated variations of the “waitin’ on my boyfriend” line, and somehow Gilgun’s unhinged, drunk vampire is emerging as the voice of reason. Ruth Negga's Tulip deserves better. Like Jesse, Elliot never opens up to his supposed best friend, and barely holds a conversation with anyone around him, choosing instead to exit in silence to their confusion and frustration. But again, thanks to the voice over and scenes where Elliot imagines himself having these conversations, the viewer at least gets to understand what he is thinking, and truly see the conflict and disconnect in Elliot’s mind. And while Mr. Robot’s secondary characters are not nearly as dynamic and creative, Gideon’s death was more shocking and emotional than Eugene’s disappearance. Preacher still has it’s moments of the dark comedy and slick, ridiculous violence that it promised, but like its character exposition, it doles them out way too stingily. And yes, it is beautiful to look at, but overindulgent with the pretty shots. Whiskey is not a character trait. For the first couple episodes, it seemed to be pursuing an episodic sub-plot pattern, with Jesse confronting one local sinner each episode. 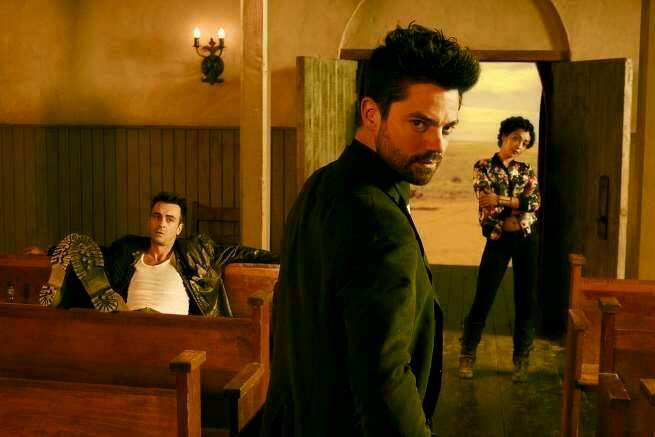 Preacher would have been wiser to continue this, at least as a hold over until it gets to the real action, which is still being teased for the finale/second season, but instead it continued to push viewer patience. Episode 8 ended with Preacher asking Quincannon for one more Sunday to finally deliver on his promises. Preacher is asking us for two more Sundays. Mercy.